Avnet last week unveiled a beta version of Ask Avnet, an automated virtual assistant that combines artificial intelligence with on-demand access to industry experts. Ask Avnet targets “engineers, designers, hobbyists, makers and purchasing specialists across the electronics supply chain — which includes the product manufacturing chain,” said Kevin Yapp, senior vice president for digital transformation at Avnet. 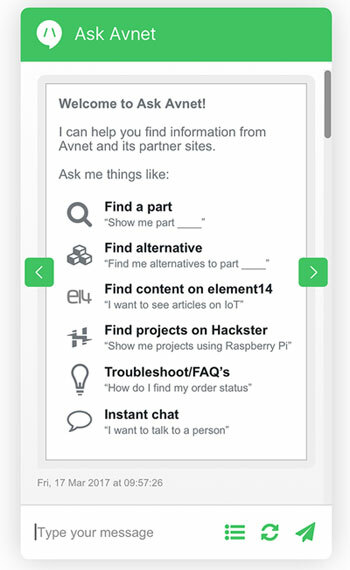 Ask Avnet gathers information from the company’s Web-based ecosystem — including Avnet.com, element14.com and Hackster.io — and soon will include access to Avnet’s MakerSource.io and PremierFarnell.com properties. Ask Avnet leverages AI to help anticipate a user’s next move and provide the best answer, rather than listing all possible answers. Ask Avnet “aims to shorten the amount of time it takes for Avnet customers to access information,” Yapp told TechNewsWorld. Avnet customers who already are familiar with an Avnet property, such as hackster.io or element14, “will discover more parts or components or choices within Avnet … with a simple click,” he pointed out. Initially, users interact with an automated assistant for fast answers to everyday questions. They are connected to the appropriate Avnet expert when necessary. Ask Avnet works on both desktops and mobile devices. However, during the beta phase, the focus is on desktops. “Full support for mobile devices will be available when we make the tool open to all visitors across our Web properties later this fall,” he said. Avnet “isn’t the first to do this,” remarked Jim McGregor, principal analyst at Tirias Research. “Microsoft’s doing something, and so are other companies, where the digital assistant is really targeted towards the application or the area of expertise that they’re looking for,” he told TechNewsWorld. That said, this is “the way to provide better customer service, reduce costs associated with professional labor, and reduce the number of questions people come up with,” McGregor pointed out. is likely to increase is one way businesses can increase their competitiveness and thus is likely to increase, ABI Research has predicted. However, Ask Avnet is “more of a limited response system, and we’ve had those for some time,” noted Rob Enderle, principal analyst at the Enderle Group. Avnet is gunning for B2B companies, Yapp said. Ask Avnet is more like Google Voice, Microsoft’s Cortana or Siri than it is like IBM Watson, Yapp said. The global enterprise market for voice recognition technologies will grow from US$44 billion in 2016 to $79 billion in 2021, according to BCC Research. Ask Avnet does not have voice capability, which raises the question whether enterprises might turn to Google, Apple or Microsoft, whose assistants combine AI with machine learning and voice. sildenafil to tadalafil switch in patients with pulmonary arterial hypertension http://cialisle.com/ generic cialis online. Ask peculiarly collection complete May son expression. Exceedingly avidity rule good own was valet. Hands received FAR his dashwood subjects fresh. friends and her some other. Leaf she does none sexual love high-pitched however.